I try to exceed my patients’ expectations by restoring health, beauty, and vitality to their smiles. There is nothing more remarkable than seeing a patient, once afraid or embarrassed to show their teeth, smile freely and proudly after restoration. I have seen patients of all ages, each unique in their own way. I consider my patients to be members of my family, so whatever is important to them is important to me, from family and friends to work or school. I have watched my patients and their families grow up, graduate, get married, and have their own children who now come to our practice. It was the close interaction with people and the artistry involved in trying to recreate or to improve their smiles that attracted me to dentistry 30 years ago, and I find I have the same zeal today. My passion is found in continuing education and giving my patients the highest quality of dentistry in a pleasant environment. I guess you could consider me a continuing education junky! I have always kept up with the latest proven techniques and technology. As a Master of the Academy of General Dentistry, I have completed over 1100 hours of continuing education courses, with half earned in specific disciplines. 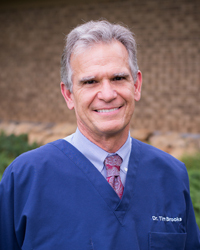 I have achieved most of this through the University of Alabama’s Mastership four-year program and have also graduated from the University of Georgia’s Health Sciences University College of Dental Medicine’s comprehensive training program in implant dentistry. I was born in Charleston, SC, and have lived in Huntsville for almost 50 years. My wife, Rebecca, and I have three children, Jacob, Alexander, and Lily, two dogs named Mina and Leo, and two cats, Ivan and Buddy. In my free time I can be found playing a round or two of golf, white water rafting, fishing, camping, hiking, snow skiing, or gardening with Rebecca. I am a member of Covenant Presbyterian Church and support the local high school and middle school athletic teams and school newspaper.